Fueled by a December bounty of $70.9 million in venture capital dough, tech-focused brokerage Redfin is taking the nation by storm and becoming a national real estate portal powerhouse in the process. With operations launching today in Buffalo, New York, the Seattle-based firm has entered 21 new markets so far this year. Its U.S. coverage has now swelled to 34 states, a jump of 12 states from the total at the end of 2014. 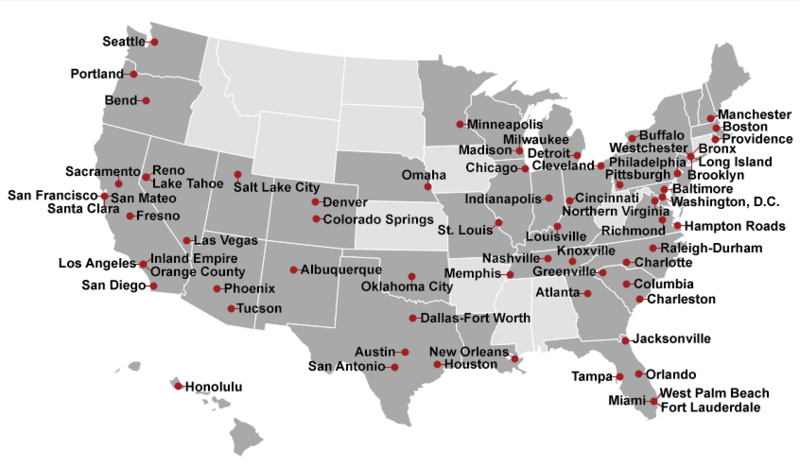 Redfin is approaching nationwide coverage. Redfin’s blooming has also catapulted the brokerage’s website to national prominence. In April, it attracted 2.33 percent of all real estate traffic from desktop and mobile devices, making it the sixth most popular real estate site that month, according to Experian Marketing Services. Unlike the portals ahead of it in popularity, Redfin stands apart as a brokerage site, giving it superior accuracy and coverage in some markets. As a broker and a participating member in the multiple listing services in the markets it represents buyers and sellers on home deals, it displays real estate listings and data from Internet data exchange (IDX) feeds. IDX feeds are the shared pool of listings that brokers in a market use to power their consumer consumer search platforms. Zillow, Trulia and homes.com get listings from a variety of sources including MLSs, brokers and agents. Zillow powers search on Yahoo Homes, while realtor.com, thanks to its unique relationship with the National Association of Realtors, has greater listing coverage and accuracy with most of its listings coming directly from MLSs. Redfin is at the vanguard of a crop of tech-focused brokerages whose websites are gaining in popularity, including Movoto and Estately. Movoto and Estately attracted 1.41 percent and 0.75 percent, respectively, of all real estate traffic in April, according to Experian. Movoto was the ninth most popular site that month and Estately was the 16th most popular.